31 Days of Juicing. Day 1: Just Do It. Note: Below are links to the entire series. Day 5: Hang in There! I’ve posted about juicing in the past and get a ton of questions about it. This is a great way to share my experiences with you. When I first decided to start Juicing I devoured the internet for information and had a hard time finding the information I craved. It’s my hope that this will be a good source of information and reference for people searching in the future. I have lost over 50 lbs, but want to lose much more. When I saw the 31 Day blogging challenge I decided the time is now and what better way to commit myself than to do it publicly? Juicing has changed my life in so many ways. I just want to shout it from a mountain top… This is my mountain… do you want to climb it with me? Here’s the skinny of it. I’ll post everyday – short and sweet, nothing too long. The next three days will involve getting ready. I’m not interested in making myself miserable by going into withdraw by starting juicing cold turkey. I currently juice each day anywhere between 1 to 2 juices – usually one fruit juice plus a green juice and/or carrot juice. My current diet is pretty healthy (although not always) and amazingly I have maintained my 50 lb loss for several months now. To my dismay, I have gotten back into drinking coffee with half and half and have been known to have a bad carb or two or three. Believe it or not, I have more energy without caffeine. Unfortunately, Starbucks and I have a bond that’s hard to deny. Drink lots of water. I don’t have an aversion to water, but for some reason this is a chore to me. I am striving to get better at this. No sugar. None, zero, zilch. I haven’t had any in a few days, so I’m telling myself this is easy. Hah! Fruit of course is okay, but I won’t have any bananas. No dairy except for the half and half in my coffee. After Wednesday, none. Three cups of coffee today. Two tomorrow. One on Wednesday. None after that. 2-3 Juices a day with chia and flax seeds. This is easy. I make them in the morning and I can drink on the go. Have a bowl of my favorite minestrone for dinner. Click here to see the brand I make. Love this soup! When I make it, I don’t add any meat or pasta. I do add two stalks of celery cut up, two carrots chopped and half of an onion. It’s delicious and I like that the beans add protein. The point here is no meat or pasta. No meat. No problem as I haven’t had meat in a few days. I don’t think cutting out meat causes any withdraw symptoms… well physical symptoms anyway. Some people may mentally miss it! I’m not a vegetarian, but I’m not tied to meat like I have been in the past. I’ll eat a salad if I want one with a little vinaigrette dressing, but chances are I won’t. If I have a munch attack at night I’ll grab a small handful of nuts. If you think I’m crazy, watch Fat, Sick and Nearly dead for free over at Join the Reboot – a fabulous site that’s all about juicing. If you want to see what Joe Cross of Fat, Sick and Nearly Dead recommends about preparing for a juice, you can see it here. In fact I highly recommend exploring his site for loads of information. If you want my story on how I joined the juicing bandwagon you can see it here. If want to see how losing 50 lbs by juicing changed my life, click here. Disclaimer: I’m not a doctor, not a nurse, not a nutritionist. I’m just someone who needed to lose weight, get healthy and feel better. I didn’t go to my doctor before I started juicing, but you probably should. In other words if you try this, you do this at your own risk and I take no responsibility for it. I will be happy to answer any questions you have, but again, it will just be my opinion and will be based on my personal experience which may differ from yours! 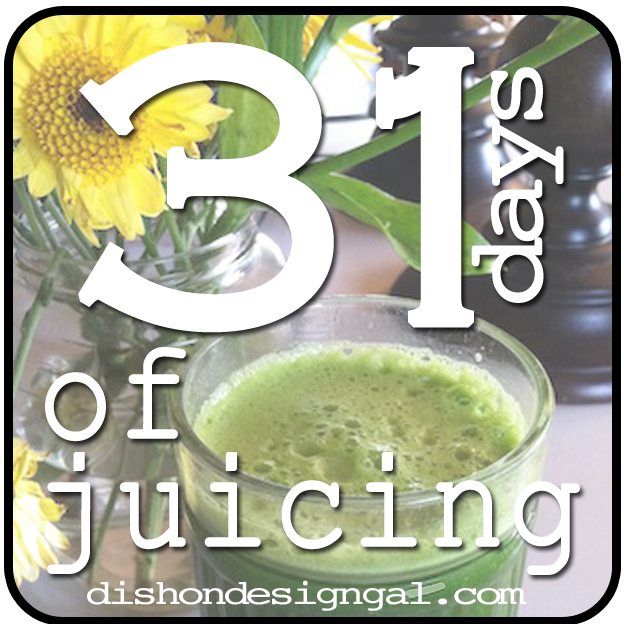 This entry was posted in 31 Days of Juicing, food and tagged 31 days, feel good, get healthy, how to juice, Juicing, lose weight, reboot by Dish on Design Gal. Bookmark the permalink.